iChecks runs completely in the background processing check runs – with no needed changes to your existing AS/400, iSeries, System i applications or check printing operations. 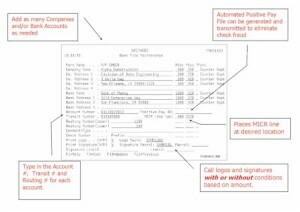 Through user-friendly menus, authorized IT administrators can define the check application business rules, OutQ destinations, routing and archiving instructions. See Bank FIle Maintenance Screen below. iCheck Improves Security – inFORM Decisions’ iChecks software only allows users with appropriate passwords the ability to add and modify bank account information, design check templates, add signatures and logos, and start the “engine” process.“MICRizing” inFORM Decisions can talk to you about optionally “MICRizing” existing laser printers or new lasers on the market, and offer tools to convert existing HP, Lexmark, IBM, Xerox and others into secure, reliable laser MICR printers. As a IBM and Hewlett Packard Business Partner for a number of years, IFD is uniquely qualified to provide the needed advice for converting or acquiring reliable and secure MICR Laser check printers. Customer Testimony – inFORM Decisions’ clientele lend credibility and testimony to their industry recognized MICR systems. Clients like Wachovia Bank, Glaxo Smith Kline, KOA, Sara Lee and Toshiba and hundreds more utilize inFORM Decisions’ Document Automation systems and components.